Turmeric, the brilliant yellow-orange spice that adds color to curry, also affords numerous health benefits. 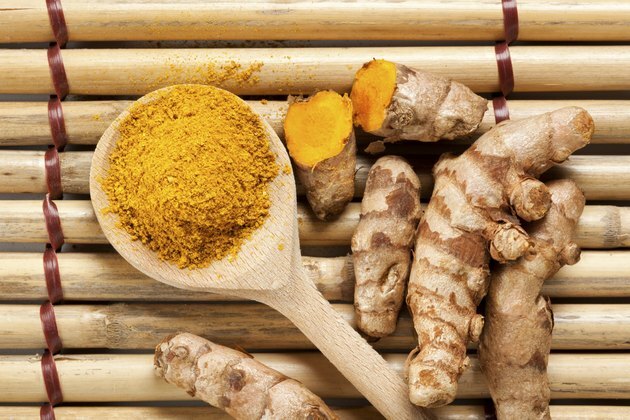 The primary antioxidant in the spice, curcumin, is an anti-inflammatory that's been used for centuries in medicine. Turmeric also offers promise in helping you deal with obesity and its related metabolic disorders. While increasing your intake of turmeric isn't a lone strategy for weight loss, it may help you mitigate the inflammation associated with obesity and give you a boost in fat burning. Obesity creates a low-grade inflammation in the body that puts you at a higher risk of developing chronic diseases, including heart disease and type 2 diabetes. Curcumin, an antioxidant in turmeric, suppresses inflammatory messaging in many cells, including pancreatic, fat and muscle cells. This action can help curb insulin resistance, high blood sugar, high cholesterol levels, and other metabolic conditions resulting from obesity, notes a review published in a 2011 issue of the European Journal of Nutrition. When your body isn't fighting so much inflammation, it's easier to focus on weight loss. Preliminary findings in studies involving rats also suggests that turmeric may have the ability to reduce weight gain. A 2009 study performed at Tufts University found that curcumin actually suppresses fat tissue growth in mice. When you gain weight, fat tissue expands when new blood vessels form. Mice fed curcumin were unable to form these blood vessels and thus had less fat gain that those who did not consume the antioxidant, despite both groups' high-fat diets. Similar research has not been performed in humans, so it's not certain curcumin consumed by humans in the form of turmeric will have the same effect. Turmeric is a readily available spice, and adding it to your diet has no side effects, unless you have an allergy. Add it to marinades, tomato-based sauces, homemade salad dressings or grilled meats for a bit of extra flavor and potential weight-loss benefits. For an antioxidant punch, blend it into foods that are already yellow, such as scrambled eggs, stir-fried summer squash or macaroni and cheese. Turmeric, especially taken as a supplement, can interact with certain medications so always consult your doctor when considering adding it to your diet. Turmeric can increase your risk of bleeding if you're on blood thinners, interfere with the action of drugs that reduce stomach acid and increase the risk of low blood sugar when taken with certain diabetes drugs. Turmeric is also contraindicated if you have gallstones or obstruction of the bile passages. If you take large doses for long periods of time, you may experience stomach upset and ulcers. Your healthcare provider can recommend an appropriate dosage. Although turmeric may help with inflammation and fat cell expansion, it isn't a weight-loss miracle. You must still eat less and move more to create a calorie deficit to lose extra pounds. Talk to your doctor or use an online calculator to determine your daily calorie needs, which varies according to size, gender, age and activity level. Then, create a deficit of 500 to 1,000 calories from that rate to lose between 1 and 2 pounds per week. Use a combination of dietary restrictions and exercise. For example, if you typically eat 2,000 calories per day, burn 250 more calories per day through exercise and eat 250 calories fewer every day to lose 1 pound per week.